The Krestovsky stadium, that was at last finished on December 30, 2016 after almost decade under construction, will host its first event aimed at testing the venue. A free moto show is going to be attented by 10,000 visitors. The social media accounts of organizers of the show are being attacked by numerous questions on how to register for the event. The show under the name of The First Visitor will reportedly take place on February, 11. As organizers say, the main task of it is to see how the venue is capable of hosting 10,000 visitors, point bottlenecks out and test light and sound equipment. A special photo zone will be organized for taking selfies. Registration has not still been opened, and those willing to visit the Zenit Arena stadium (other names are Krestovsky stadium, Gazprom Arena and… Shame Arena) took their places in virtual queue asking the organizers great amount of answers about how to guarantee a place at the event. Given that February 11 is Saturday, no doubt that there will be no shortage of visitors. Some swindlers were fast to propose people to buy tickets for this free show. There were jokes in social media that visitors might not come back alive. 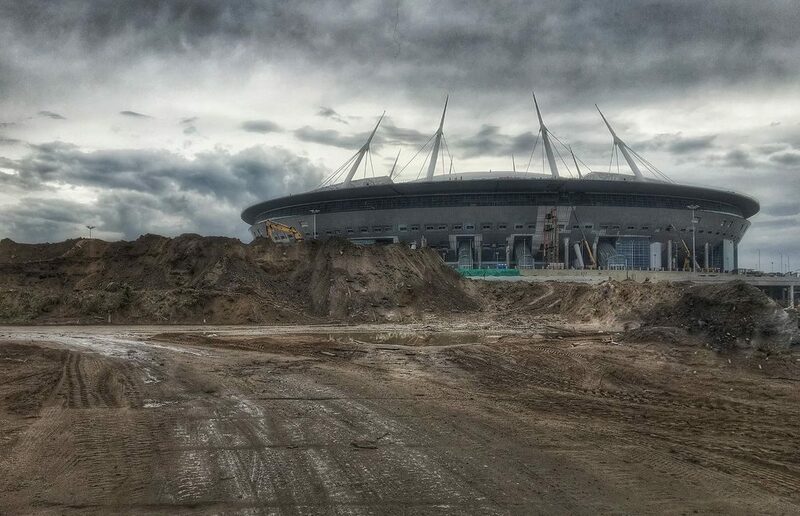 The basis for such jokes is that the Krestovsky stadium, turned into a symbol of corruption, has not still been completed yet. Now final works are in the making, a final touch will be made only on May 1, officials said. Transparency International claimed that the construction of the Gazprom Arena may cost as much as 50 billion rubles (now one dollar equals about 60 rubles). — You can see a stadium in the form of a spaceship out there, it cost Russian taxpayers about 1 billion euro… No, madam, it cannot fly even for such huge money. Interestingly, that the news about the moto show came together with the proposal of Alexander Kerzhakov, FC Zenit St. Petersburg’s player and Russian international, to hold a football match of world football legends before the opening of the World Cup 2018 at the Palace square. Well, if the Krestovsky stadium fails again, then maybe even World Cup games will be played just in opposite of the Hermitage. Hopefully, Mr Kerzhakov will not miss the gate to break Hermitage’s windows and hurt any of its treasuries.